LIVERPOOL BROUGHT THEIR impressive pre-season to a close by cruising to a 3-1 win over Torino tonight. The performance seldom hit the emphatic heights of Saturday’s 5-0 thrashing of Napoli and suffered something of a false start when new signing Fabinho swiped a penalty wide after Gleison Bremer tripped Sadio Mane. It mattered little as Roberto Firmino opened the scoring with a deflected effort in the 21st minute after Mohamed Salah slalomed across the field. There had been wholesale changes – including Loris Karius replacing Alisson on the latter’s maiden Anfield appearance – and two substitutes combined to make sure of victory. Xherdan Shaqiri brought down a raking ball and exchanged possession with Nathaniel Clyne before floating in a cross for Daniel Sturridge to nod in. 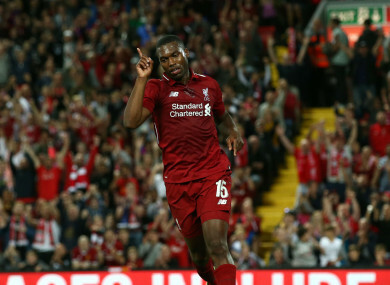 The win, coming on the heels of the trouncing of Napoli and wins over both Manchester clubs, leaves Jurgen Klopp’s men in form as they prepare to open their Premier League campaign against West Ham on Sunday. Email “Liverpool conclude free-scoring pre-season with win over Torino”. Feedback on “Liverpool conclude free-scoring pre-season with win over Torino”.